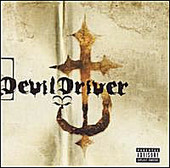 DevilDriver is not the 1st round for the famed Leader DezFafara of a band you might know as coal chamber.I think this album starts off where Coal Chamber's Dez left off moving forward with its production and ahead an this extremly heavy album.Which is why Coal chamber no longer exists Dez always wanted to create an ablum like this and he definately got what he wished for FAST AND BRUTAL! This album is hard, heavy and spinning out of control with anger on such catch yet insane songs as "Swinging the Dead" , "Devils Son", "I could care less" , "I dream I died". A lot of times music like this seems like noise to some and to others a masterpiece of it's time, I fall somewhere in between.The album seems to have been sculpted around several of the more catchier songs and yes again where some songs seem like noise you might just find a favorite that you just cant resist.All in all its a great metal album that will leave its trace with solid sales,the extreme sound and the non stop touring and vocals that just cant be reproduced in this lifetime. So if you are a fan of SLIPKNOT, HATEBREED and music like that this is listener friendly to your ears.